I’m so excited, I’m going to try a new kind of art!!!!!! Is that why you have my watercolors? Yes! And I’m going to do some plain paintings. And by “plain” you mean…? Plain Air!!!!!!! I’m going to be a Plain Air Artist. You mean Plein Air. That doesn’t mean plain. It means painting outside, from nature. Oh. Well that sounds even better!!!!! So, I need to go outside. You are an indoor cat, sweetie. It’s safer that way. But there should be exceptions, especially for art. 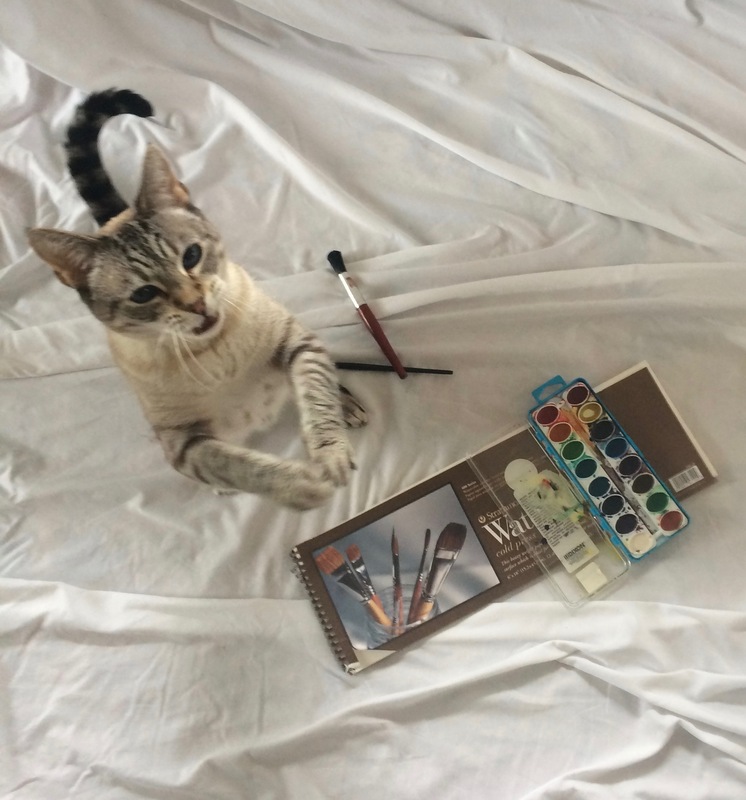 I am an artist, and I am all excited about this new art experience. And it has to be done outside. So it’s time for an exception. You can go out on the balcony and paint a picture of the garden. It’s lovely right now. But I need something more exciting than that! There are squirrels out there. They are lively enough to be an exciting subject. Squirrels are not exciting. They are everywhere. They are so common here they are ordinary. There are lots of crows out there. And they will yell at you. That’s exciting, right? Being yelled at by crows isn’t exciting. It’s annoying. How about this: there’s a pair of Red-tail Hawks out there. Maybe one of them will swoop down and try to pick you up. That would be exciting. A frisson of danger to elevate the experience. That sounds terrifying! Why would you let me go out there if that can happen? I was just kidding. It’s not really a worry, sweetie. You’re too heavy for a hawk to pick up. Well anyway, don’t worry about the hawks. And I am not heavy! Hahaha; as usual, you make me smile! I related to this one because I’ve taken up painting in water colours; not having done it since my youth. I’m painting the illustrations of a children’s book I’ve done. Good luck to Mia—it’s not that easy!